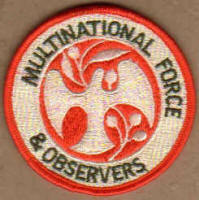 The Multinational Force and Observers was an International Mission to which Canada contributed soldiers and equipment. In 1979, following the signing of the Israel-Egypt Peace Treaty, the United Nations decided not to continue their peacekeeping mandate on the Sinai Peninsula. The terms of the treaty required the presence of international peacekeepers to ensure that both Israel and Egypt kept to the provisions regarding military build-up along the border. Initially, the peacekeeping force was provided by the US Sinai Field Mission, while efforts were made to persuade the UN to change its mind. When it became clear that this would not happen, Egypt, Israel and the United States opened negotiations to set up a peacekeeping organization outside the framework of the UN. On 3 Aug 1981, the Protocol to the Treaty of Peace was signed, establishing the Multinational Force and Observers. The MFO assumed its mandate on 25 Apr 1982, the day that Israel ceded sovereignty of the Sinai Peninsula to Egypt. 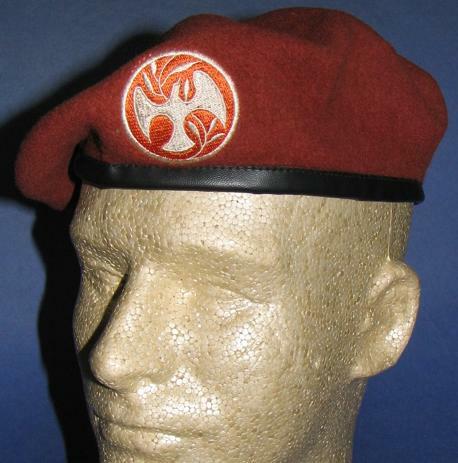 In 1995 the United States experimented with a composite battalion consisting of National Guard soldiers from Virginia and Maryland, and Regular Army soldiers from the 82d Airborne Division and the 101st Airborne Division (Air Assault). Canada's contribution began in Mar 1986, with a 136 person Rotary Wing Aviation Unit as well as 8 staff officers for MFOHQ. 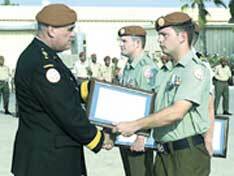 MFO Force Commander Major General Robert G Meating at left, wearing the MFO formation patch, presenting a New Zealand Private the Multinational Force Silver Driving Award. MFO Photo. Zone A: Between the Suez Canal and Line A. Egypt permitted a mechanized infantry division with a total of 22,000 troops in Zone A. Zone B: Between Line A and Line B. Egypt permitted four border security battalions to support the civilian police in Zone B. 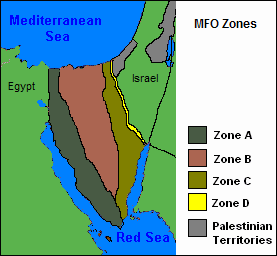 Zone C: Between Line B and the Egypt-Israel border. Only the MFO and the Egyptian civilian police permitted within Zone C.
Zone D: Between the Egypt-Israel border and Line D. Israel permitted four infantry battalions in Zone D.
North Camp included Force HQ and was located close to the town of el Gorah. South Camp was located near the town of Sharm el Sheikh. In addition thirty smaller sites were located at various points within Zone C, and at least one remote observation post (OP 3-11) located on an island offshore. The insignia of the MFO was a white badge (symbolizing peace) with the orange suggesting the bright coloured jump suits that civilian observers in the MFO wore. 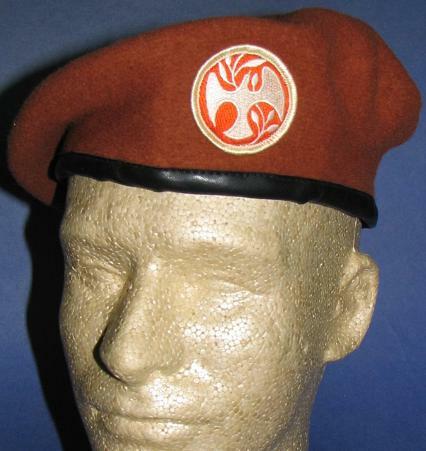 A beret in either blaze orange, or in a subdued rust colour, was worn also. These civilian observers operated as part of the US Sinai Field Mission in 1976, tasked with monitoring two major passages through the Sinai Peninsula between Egypt and Israel. In 1982, the multi-national MFO incorporated this Sinai Field Mission. The UN had refused to provide a peacekeeping mission to the area as officially the two nations were at peace. Canadian troops have served on the MFO since inception, mostly from logistics trades; between 1986 and 1988 Canada provided a four-ship helicopter squadron of UH-1s to the mission. Berets from the Ed Storey collection, showing two sizes of beret badge. Formation patch examples at right courtesy Bill Alexander, showing Canadian manufacture, and two badges of international manufacture. The MFO Medal was awarded to personnel completing the qualifying time for this award, which was six months cumulative service any time after 25 April 1982.